In Vitro Methods in Cell-Mediated Immunity focuses on methods for approaching cell-mediated immune responses in vitro. 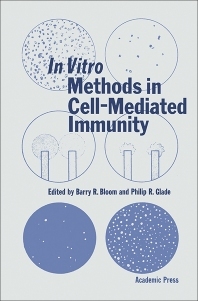 This book provides, in simplified in vitro systems, a basis for understanding the mechanism of the in vivo response and discusses useful and reliable in vitro tests for cell-mediated immune responses in humans, where in vivo testing is often not possible. The topics discussed include factors and activities produced in vitro by lymphocytes; biological implications of in vitro phenomena; and requirements and prospects for improved methodology. The leucocyte migration technique for in vitro detection of cellular hypersensitivity in man; proliferation of human blood lymphocytes stimulated by antigen in vitro; and virus plaque assay for antigen-sensitive are also elaborated in this text. This publication is a good reference for microbiologist and immunologists, including medical students researching on in vitro models for cell-mediated immune reactions. Dr. Bloom is Harvard University's Distinguished Service Professor of the Department of Immunology and Infectious Diseases and Former Dean of the Harvard School of Public Health. He received a bachelor’s degree and an honorary Sc.D. from Amherst College, and a Ph.D. from Rockefeller University. He is widely recognized for his work in the area of cell-mediated immunity, infectious diseases, particularly tuberculosis and leprosy, and global health. The discovery of lymphocyte-produced cytokines and the development of genetic systems in mycobacteria are among his scientific contributions. He has published over 300 papers and edited 4 books. He served as a consultant to the White House on International Health Policy, was elected President of the American Association of Immunologists, and served as President of the Federation of American Societies for Experimental Biology.